A New Zealand short-tailed bat pictured while eating dactylanthus. Credit: Nga Manu Nature Reserve. (Phys.org)—Ancient dung from a cave in the South Island of New Zealand has revealed a previously unsuspected relationship between two of the country's most unusual threatened species. 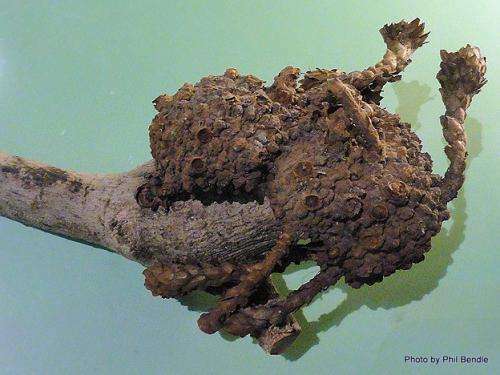 Fossilised dung (coprolites) of a now rare parrot, the nocturnal flightless kakapo, contained large amounts of pollen of a rare parasitic plant, dactylanthus (commonly known as "wood rose" or "Hades flower"), which lives underground and has no roots or leaves itself. Researchers from the Australian Centre for Ancient DNA (ACAD) at the University of Adelaide and Landcare Research and the Department of Conservation in New Zealand report the discovery today in the journal Conservation Biology. The musky sweet smell of the dactylanthus flower attracts the only remaining known native pollinator, the endangered New Zealand lesser short-tailed bat, which forages extensively on the forest floor. The parasitic plant, Dactylanthus taylorii, attached to the root of a host tree. Credit: Phil Bendle. Kakapo are extinct from mainland New Zealand and their recent introduction to the island sanctuary of Hauturu/Little Barrier Island, where dactylanthus survives, has re-united the two species for the first time in potentially a century. 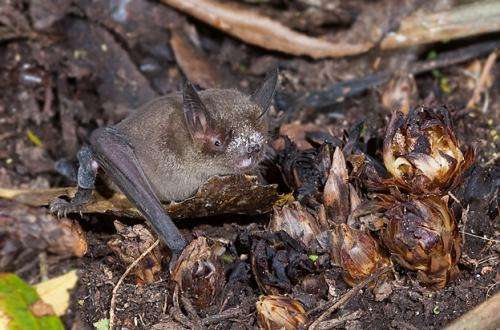 "This is an important example of an apparent tight co-evolutionary relationship between threatened endemic species - the plant and burrowing bat - simply representing 'the last men standing'," said ACAD Director Professor Alan Cooper. "The coprolites suggest that kakapo may have served as pollinators, probably along with other species, which is critical for conservation - and reveal the extent of the ecosystem links which have been broken." Lead researcher Dr Jamie Wood, from Landcare Research in New Zealand, said: "Coprolites are one of the only ways to reconstruct important pre-human ecological relationships, such as pollination and seed dispersal, which must be restored to conserve these species over the long term." The team is funded by a New Zealand Marsden grant to study the pre-human ecosystem using preserved coprolites from caves and rockshelters across New Zealand. Dr Janet Wilmhurst from Landcare Research said: "Dactylanthus is now restricted to around 4% of its pre-human range, due to forest clearance, predation by introduced mammals and a lack of pollinators and seed dispersers. Scattered populations only survive in the central North Island."